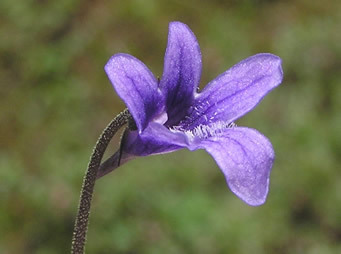 Common Butterwort, Pinguicula vulgaris, is a carnivorous perennial of bogs and damp areas with a rosette of yellow-green, sticky leaves that can trap and digest insects which they need because of the poor nutrition thay receive in their environments. Another moist lover is Sitka Valerian, Valeriana sitchensis, it enjoys the middle and upper altitudes of the mountains. 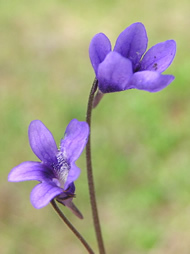 It can be found in the wet meadows as spring arrives and the snow pack gives way to the warmer days. 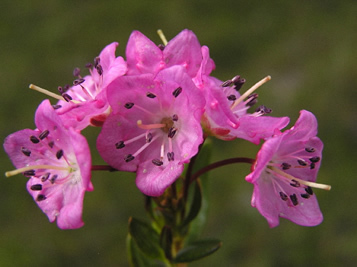 One of the shrubs that one may encounter, Western Bog-Laurel, Kalmia microphylla ssp occidentalis, is a handsome looking plant but as it is rather low growing it can easilly be passed by at it blends in very well with the red colors of heathers that occupy their place at these altitudes. 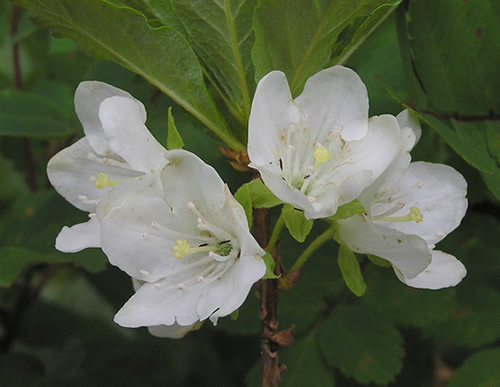 Many gardeners know rhododendrons and indeed may very well have plants in their garden, so the mountains have theirs, the White Rhododendron, Rhododendron albiflorum, This shrub can reach a height of over well 6 feet with beautiful groups of white flowers. 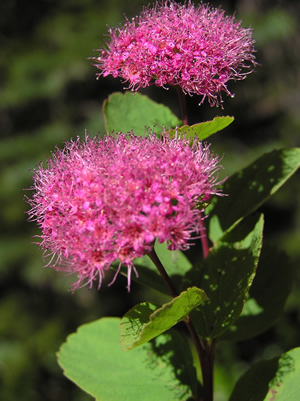 This low- flowering shrub, never reaching over three feet high bears, is Spiraea densiflora, with the common name Mountain Spiraea. 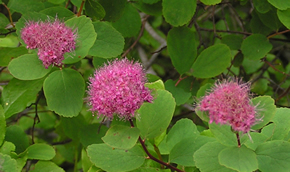 It bears fragrant pom-pons of rosy red flowers. 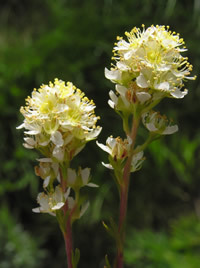 It grows in moist thickets and open rocky areas at subalpine elevations. 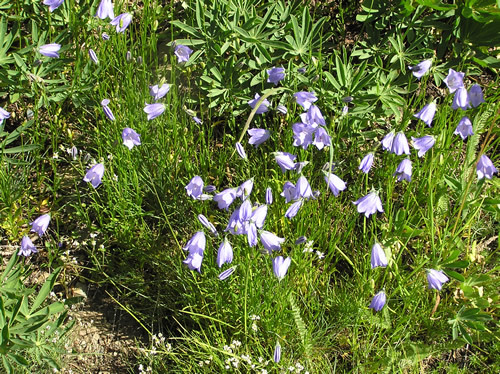 Mountainbells, Stenanthium occidentale, is one of the poisonous plants of the high elevations. 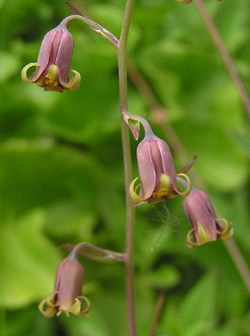 The beautiful bell flowers make this a most magnificent plant. 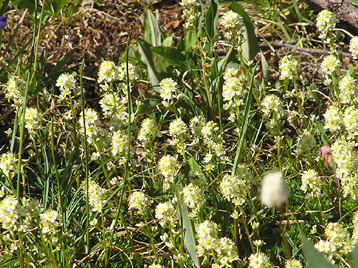 One of the low growing plants that is mat forming is Luetkea pectinata, with the common name of Partridgefoot. This common name refers to the leaves that resemble the footprints of those birds. 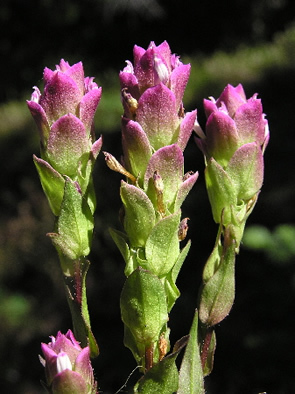 Single plants are easily missed by the casual stroller, but are worth a close look when found. 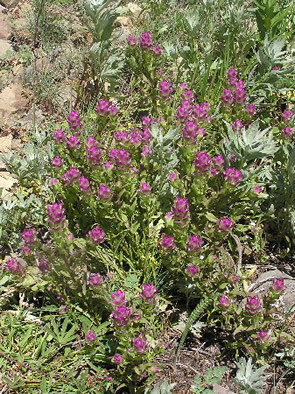 Mountain Owl Clover, Orthocarpus imbricatus, is an annual plant which likes the dry meadows and rocky slopes with thin soil. All the leaves are on the stem and lance shaped. Found at middle to high elevations. We end this selection of alpine flowers with a close up of the flowers known as the Bluebells of Scotland - delightful flowers that live In the Shadow of Peaks.